Please don’t roll your eyes. This is serious business. Let’s talk about hair cuts. You’re due for a cut and call to make an appointment. On the phone you tell the hair dresser (or stylist or receptionist – that would be in direct correlation to how much you pay per visit) what needs to be done. Suppose you’re a girl, so you book a wash, a cut, and perhaps highlights. Rather odd? And you say you’ve never ever done that? My precious wife had her choppers cleaned yesterday. I wish I had been there: Can you imagine how baffled the hygienist looked when she instructed her to do only every second tooth, because the other ones would be cleaned by a different practice? Now you’re really rolling your eyes, thinking these are rather unlikely scenarios. Or I’m just under-medicated today. But no, that’s what’s happening frequently in real estate offices. I know because not only do I run a real estate office for 20 years, I also sat on a committee that had to decide on commission disputes when a buyer – and it’s nearly always a buyer – hired several Realtors at the same time. Without telling either one to boot. The real estate market in a lot of countries – Germany is one example – works differently than in the US. Without the common property database “MLS”, buyers are forced to contact many different offices to see everything that is available. Manhattan (NY) has the same problem; several attempts to install an MLS there have failed. But that is atypical for the US. 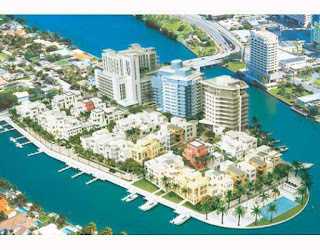 In Southeast-Florida as an example, the MLS reaches from Homestead to Fort Pierce, connecting approximately 23,000 agents and 95,000 properties and businesses for sale. There is zero need to work with several Realtors at the same time in the same area. By now, you simply can’t wait any longer to learn what a well-educated, smart, good-looking and sophisticated buyer like yourself should do, right? The advice: select your Realtor carefully, if applicable to your situation ask if he/she will work as your buyer’s agent, and if you are happy, remain monogamous. If you’re unhappy, say your piece and give your business to someone else. But please work with one agent at a time. You have nothing to gain by becoming a real-estate-.... (rhymes with “nut”). You waste your own time and the time of the people you hired. And that is disrespectful to any profession. PS: my wife didn’t switch dentists halfway through treatment. But you knew that already. On January 11, Miami-Dade county moved it’s foreclosure auctions from the courthouse steps to the web. The goal: to burrow through a pile of 115,000 foreclosure cases – with an additional 7,000 coming in each month. The old method, favouring insiders, professional investors and schoolyard bullies, handled ca. 450 cases a week; the online auctions, allowing buyers worldwide to bid from the comfort of their velvet La-Z-Boy, is expected to process 2000 or more homes and commercial properties weekly. Impressive. This is happening none too soon: The county is weighed down by the seventh-highest number of foreclosed homes in the US, and according to court clerks, more than 135,000 foreclosures could be filed in Miami-Dade, Broward and Monroe counties this year – compared to about 17,500 in 2006. No calculator handy? That’s plus 771 percent. To participate in a Dade online auction, register for free at http://www.miamidade.realforeclose.com. Once you have completed this step, you can access thousands of foreclosed properties, view pictures, link to a property appraiser's report, take a street-level virtual tour of the neighborhood and check a profile on Zillow.com. If interested in a property, bidders have to put down a refundable 5 percent deposit, which can be paid online (or in person – makes sense if you're bidding from, say, Mullumbimby, AU). After entering a maximum bid, they can let their computer take over and bid on their behalf, or monitor the auction and bid manually – quite similar to the eBay system. With more than more than 2,500 registrants on the official launch date, Dade county officials must be delighted, as seem officials in other counties: Florida is the first state to adopt an online auction system for distressed properties, using the software already in nine counties. Three more will be added by March, Broward county being the next in line. – Hallelujah! Though my blog or modernsouthflorida.com do not really deal with condos, here’s another tender morsel: Fannie Mae, recognizing Florida is ground zero for the condominium bust, has unveiled a “special approval” program listing established condominium projects around the state as "sufficiently stable" enough to merit Fannie Mae loans. Nice, eh? 51 condo projects in Miami-Dade (does everyone start there simply because it’s Mile Marker 0 of Interstate 95?) qualify so far – read: they are stable enough for lenders to originate mortgages that are turned over to Fannie Mae. Across the State, more are being added. Though most sellers are looking for cash buyers, and some sellers wouldn’t touch the paper an offer is written on if not accompanied by proof of equity, the list could breathe some life into the dismal condo situation in Dade. Inventory hovers at 16,162 resale condos per Jan 7 – that equals sixteen months inventory at the current absorption rate, not to mention new construction not listed in the MLS. Now you wonder where to find that Fannie Mae list, don’t you? Well, please stay tuned for the April 1st post. – Have a nice weekend! The second installment of the series examining current market values will have a look at available modern townhomes in Southeast Florida. Because of the relatively small number, this post includes all price ranges. Historically, the term townhouse was coined in the UK, a “house in town” for aristocracy and wealthy country peers. In the US, it used to describe an attached multistory building with a small footprint, including servant’s quarters, located in an urban environment. Owning a townhouse in a metropolitan area such as New York, Chicago, Boston, Philadelphia, Toronto or San Francisco was a sign of wealth. Today in Florida, a townhouse in a strict sense means an attached multistory building with no neighbours above or below, often with a small garden and community amenities such as a pool or tennis courts. Legally, one differentiates between fee simple (exclusively owned, including the land) and condominium townhouses, where the occupant owns the interior only and part of the common areas. Forget mid-century modern. In Southeast Florida, there is no such thing as a mid-century modern townhouse (elsewhere?). At least I have never seen or even heard of one in 20 years of practice. 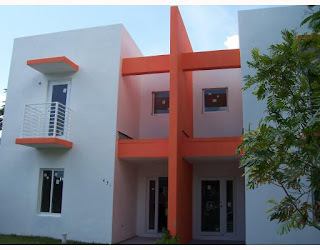 The available modern townhouses I know of were constructed 2003 or later, confirming that the first builders became aware of an increasing interest in modern architecture somewhere between 2000 and 2002. Given the confines of designing interesting and sellable multifamily structures on sometimes smallish lots, expect a bit of stylistic conformity. The starting point is the sleek white box, often three stories, with a vaguely nautical look, befitting the surroundings. Within variations mostly due to the price points, standard are kitchens combining stainless steel with warm woods, lots of glass, as well as open floorplans, often orientated around open interior staircases. If you head uptown, tile floors are replaced by marble or hardwood, private rooftop decks pop up, and period quotes such as eyebrows and corner windows appear. Geographically, the 55 available modernist townhomes I know of are all over the map between Key Biscayne and South Palm Beach county. The highest concentration however is in Miami, Miami Beach and Fort Lauderdale. Sizes vary from 1256 sf under air to 6100 sf, with a median size of 3365 sf. As varied as the size are the prices: from $299,000 to $5,495,000, median $977,000, though the sweet spot seems to be between $590,000 and $900,000. What then do you get for your money? $299,000: Miami, 3 bedrooms, 2.5 bathrooms, ca. 1,800 sf under air (ca. 165 sqm), built 2009. 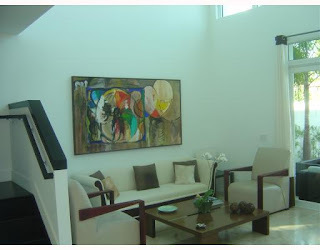 On Miami's Upper East Side, with open floor plan and two story ceilings in the entrance. $425,000: Fort Lauderdale, 3/3.5, ca. 3230 sf (297 sqm), 2-car garage, built 2007. Two story glass atrium overlooking private garden and pool, 2nd and 3rd floor loft areas, rooftop terrace. $668,788: Pompano Beach, 3/3.5, ca. 2958 sf (272 sqm), 2-car garage, deepwater dockage, built in 2007. Professionally decorated, below market bank pricing, located not far from the Hillsboro Inlet. 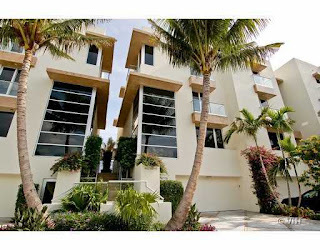 $799,000: Miami Beach, 3/3.5, ca. 2360 sf (217 sqm), 2-car garage, built in 2006. 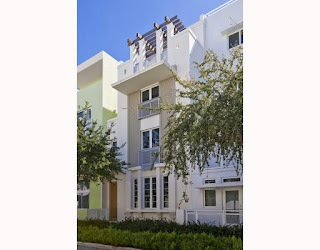 4-story townhouse on the Bay, garden rooftop terrace, heated pool and direct water views. $999,000: Miami Beach, 4/5.5, ca. 3730 sf (343 sqm), 2-car garage, built in 2005. On gated 8.5 acre-island with own fitness center, spa, heated pools, children's play center, conference room etc. $1,950,000: Miami Beach, 4/5, ca. 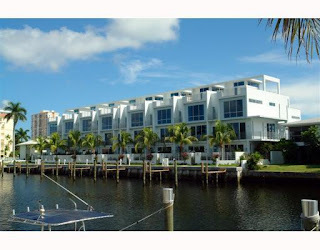 3730 sf (343 sqm), 2-car garage, private 40 foot boat-slip, built in 2005. Same location as above, but with a deepwater (read: no fixed bridges to the ocean) boat-slip. $5,250,000: Highland Beach, 5/7.5, ca. 6100 sf (561 sqm), oceanfront, 3-car garage, built in 2009. End unit/corner on 200 feet of private beach, completely reinforced concrete exterior walls, floor to ceiling hurricane impact/resistant doors and windows. Eying the trophy, you will have to decide what is most important to you. If it absolutely, positively has to be a newer (year 2000 and up) modernist single family house, prepare to budget at least ca. $780,000 (with exceptions, but not many). A newer modernist townhome – most likely built after 2003 – is a viable alternative and can be found from ca. $300,000 and up. And if that still does not appeal to you, take your pick from the considerably larger selection of mid-century modern homes on the market. A blessed, abundant and Happy New Year! I started 2010 sinning, twice. 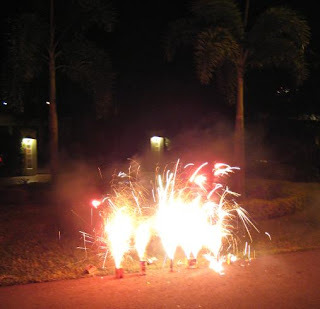 Yesterday morning, on Januar 1st, I found myself with a blog entry ready to post. But I didn’t like it. While pondering either re-writing it or posting another entry, I answered a phone call from dear friends. 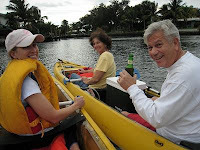 Sin #1: my wife and I dropped everything promptly and went kayaking. This is South-Florida, after all. For smaller sins you get whacked right away, as we say in German. Abandoning my Friday posting rythm and not having several alternative posts at the ready (sin #2), it got dark and windy as soon as our paddles hit the water. And this being South-Florida, it promptly started rain cats and dogs at the farthest point of our trip. We had fun though, ending the day together with our friends with two movies and excellent coal-fired pizza (from the new kid in town, Bellini Pizzeria). Not a bad way to start the New Year. It felt a wee bit guilty, but really good. (Thanks to my dear colleage Toni Napolitano for this quote).